Many recent writers use concepts taken from computer technologies to develop new ways of thinking about old religious topics. These writers can be thought of collectively as digitalists. Digitalists include transhumanists, singularitarians, and others. Writers like Moravec, Tipler, Bostrom, and Kurzweil are digitalists. Typically, digitalists are scientists, rationalists, naturalists, atheists. And yet they have worked out novel and deeply meaningful ways of thinking about things like souls and gods - souls are programs and gods are universe-simulating computers. Digitalists have developed new ways of thinking about life after death. They have produced novel interpretations of older doctrines of resurrection and reincarnation. 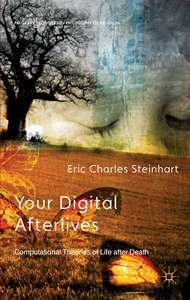 Your Digital Afterlives carefully examines three digitalist theories of life after death. It examines personality capture, mind uploading, and promotion to higher levels of simulation. On the basis of those three digital theories, Your Digital Afterlives develops another computationally-inspired theory of life after death. Along the way, Your Digital Afterlives examines the digitalist ways of thinking about bodies, minds, souls, and gods. Digitalism is a growing cultural movement. Your Digital Afterlives show that it has the potential to radically and positively change the future of religion.